The governor of Nebraska, Pete Ricketts, is a Trumplicker who is hell-bent on executing people even when his own state legislature is against it and the federal government says he can’t import the drugs. Recently, even as he announced a state budget shortfall and cutbacks to education, he found the resources to send law enforcement officers to North Dakota to help quash the protest of DAPL there. 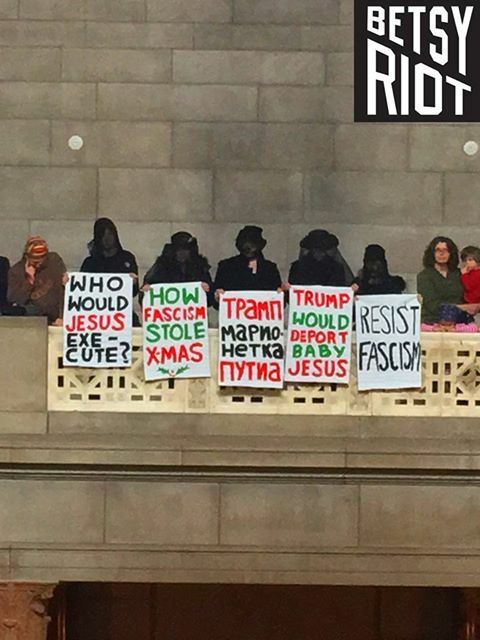 So today a riot of betsies silently protested at his extremely Jesusy Christmas ceremony at the Nebraska state Capitol building. They were eventually ejected by police. 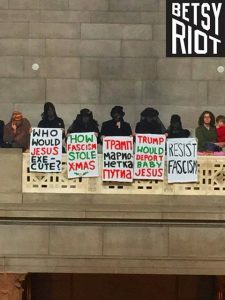 The middle sign says “Trump is Putin’s puppet” in Russian.